Sinn Féin's Gerry Adams described the talks as involving "a series of positive engagements" but he warned that his party did not see the talks as "a make or break summit" but rather part of a continuing and intense discussion. There were still issues to be sorted out, said the Sinn Féin leader but "as far as we are concerned the election is going ahead anyway. That is a matter of political principle for us". He called on all sides to use their "collective wit" to deal with outstanding issues. "There is a volume of work to be done but if we continue with this very focused approach I remain hopeful that we will get to where we want to be," said Adams. For British Prime Minister Tony Blair the "omens" were "good" and the fact that unionists and republicans were still talking through the issues was itself "a tremendous achievement". But to cite "still talking" as a measure of achievement sounded more like spin than substance. On the steps of Downing Street, Taoiseach Bertie Ahern struck a more cautious note, citing a number of outstanding issues, adding that it was „"not easy" while warning that the present process can't go on "indefinitely". Ahern stressed the importance of holding elections against the backdrop of an agreement that would enable the restoration of the institutions. US Special Envoy Richard Haass was "upbeat on talks progress", his presence fuelling "optimism" about the continuing talks. The opportunity now exists to put the conflict behind us and restore the political institutions on a sustainable footing, Haass told the media. "There is a level and quality of engagement that I have not seen in my three years in this position," said Haass. "People are engaging on the fundamental issues." It wasn't just a question of getting the institutions up and running but "keep them up and running", said the American diplomat. "I am hopeful that people understand that it is in their collective interest to make it work," he said. The United States Government "as everyone here knows" supports elections as a key element of the democratic process established by the Good Friday Agreement, said Haass. "It is preferable that elections are seen not as an end in themselves but rather lead to the restoration of the political institutions. Indeed, no one will view this one year anniversary of the suspension of these institutions as anything but a setback for the process of normalisation of political life here in Northern Ireland," he said. After participating in the Downing Street talks, the American Envoy held a series of bilateral meetings with parties in the North. "There is a genuine desire to bring this to closure, to put in place the remaining pieces of the jigsaw. Do I think there is a commitment to make this work? Yes. Do I think it will work? Yes," said Haass. "I hope there will eventually be a successful outcome to this but that's not just here yet," David Trimble told the media. But the current effort would not fail "for want of effort on our part", said the UUP leader. Reiterating his call for decommissioning and an end to paramilitary activity. Trimble continued, "we need to see people being fully committed to working with the institutions in the spirit of the Agreement and we haven't quite got all of that yet. "What we are now trying to do is encourage republicans to do the things necessary to help put the institutions back together again and I don't despair of that effort and I don't think anybody else should," said Trimble. 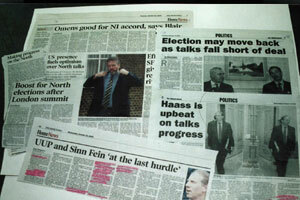 DUP deputy leader Peter Robinison impressed upon Richard Haass the urgent need for immediate Assembly elections. He called for "renewal of mandates via the ballot box" while rejecting "side deals done at Downing Street". The rejectionists within the UUP warned their party leader that "last minute deals cobbled together under the cloak of secrecy will not resolve the problems with the political process". In yet another attempt to force Trimble's hand, the three UUP MPs currently refusing to recognise the party whip, despite their repeated failure to get the majority of the UUP to support their position, issued a statement. Jeffrey Donaldson, Martin Smyth and Davis Burnside had agreed to resume the whip with the return of the British Parliament on Tuesday. But the three have rejected an undertaking sought by the UUP chief whip, Roy Beggs, that they support the decisions of the party's executive, the Ulster Unionist Council. The Ulster Unionist Party's two-day annual conference is scheduled to begin on Friday.